What should I do with the chicken from the chicken soup? Now that the weather is cooling, and more families are having home cooked chicken soup for Shabbat dinner, people ask me this question all the time. In Israel, the chicken from the soup is nicknamed oaf mechubas, or “laundered chicken.” Creative Jewish housewives have been repurposing this chicken for centuries. It is challenging to transform boiled chicken into a delicious entrée. I found some successful ways to incorporate previously cooked chicken into completely different main courses. Chicken croquettes and chicken pot pie are two crowd-pleasers you may prepare. These dishes are excellent main courses for Shabbat dinner, following the soup. Alternatively, you may plan ahead for Shabbat and make a cold chicken salad to serve for Shabbat lunch. Heat one tablespoon of oil in a heavy pot. Sauté the onions. Set aside to cool. Mix the chicken, spices, breadcrumbs, eggs, and sautéed onions in a large bowl. Heat some olive oil in the pot. Form patties from the chicken mixture. Fry the croquettes over medium heat until golden-brown. Dice the onion, carrots, celery, potato, and chicken. Heat the olive oil in a heavy pot. Add the onion, carrots, celery, and potato. Sauté for about 10 minutes. Sprinkle the flour into the vegetable mixture. Slowly mix in the chicken soup. Stir constantly until the filling thickens. Add the cut up chicken. Pour the chicken into a casserole dish. Cover with the puff pastry sheets. Cut a few openings with a sharp knife to vent the steam. Adapted from Food Network Kitchen. Cut up the chicken, scallions, and celery. Cover with plastic wrap, and refrigerate overnight. Haroset, the fruit and nut paste symbolizing mortar, has a cameo role in the Passover Seder. This is usually the first and last time that it is consumed all year. 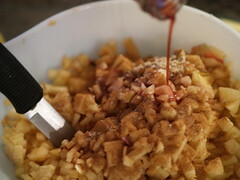 I am very enthusiastic about preparing home-made haroset. I make a Sephardic, an Ashkenazi and another haroset for the Seder. I always end up with way too much. In order to make use of my leftovers, I have found that it is possible to create a whole meal around haroset. The appetizer course is a cheese platter, served with Indian halek (walnuts with date syrup) and matzo crackers. The haroset complements many types of cheeses such as goat cheese, sharp cheddar, and blue cheese perfectly. A wonderful main course that incorporates haroset is a Moroccan tagine. Tagine is meat or chicken that is slowly braised with dry fruits and nuts. Adding the haroset just cuts back on a few steps when preparing your tagine. Add the meat, onion, garlic, and spices. Fry over medium heat until the meat browns. Add 2 ½ cups water and bring to a boil. 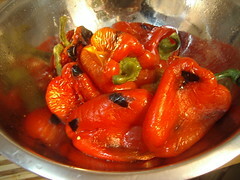 Cover the pot tightly, and simmer for 2 ½ hours. Heat the haroset in a microwave safe glass bowl for 3 minutes. Place the meat on a large serving platter. Spoon the haroset over the meat. Such a stellar main dish requires something really special to be a fitting dessert. A haroset Souffle is up to the task, inspired by the traditional French dessert. Whip the egg whites and sugar until stiff and smooth. Coat the inside of soufflé ramekins with vegetable oil. Pour the batter inside the cups. Remove the soufflés, and sprinkle with powdered sugar. Mitzvah Brei: Don’t Waste Those Leftovers! If you host a Passover Seder or two, there is a good chance that you will have a refrigerator full of unconsumed food. The principle of Bal Tashkhit (Kiddushin 32a) is basic to Jewish Law. “Bal Tashkhit” means “do not destroy.” We are instructed to avoid senseless waste or damage. When I find creative new ways to serve my Passover surplus, it feels like I am performing a mitzvah! How can you get people to enjoy the uneaten fare from your festive meal? Incorporate it with the huge supply of matza and eggs that are necessary to prepare for Passover. Dress up your matza brei (fried matza) and prepare satisfying repasts for your friends and family. Vegetable side dishes are colorful and versatile. Roasted asparagus, steamed artichokes, braised carrots, baked beets, sautéed mushrooms, or grilled red peppers may make an appearance at our Seder. Any leftovers are perfect in a matza brei. Moisten the matza with cold water. Break up the matza in a bowl. 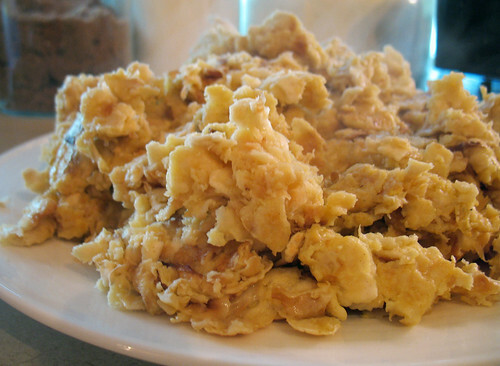 Mix the eggs into the matza. Season to taste with salt, pepper, and garlic. Pour the matza-egg mixture over the vegetables. Scramble until the egg is cooked through. This matza brei is moist, chewy, and garlicky. It is the perfect Passover comfort food. Most of us serve some sort of meat dish for the main course of our Seder. How can we extend what is left in a delicious way? By copying an inventive dish concocted in China: Egg Foo Young! We will envelop our “lotus egg” in matza! Place all the ingredients in a pot and bring to a boil. Heat the olive oil in a large skillet. Over medium heat, stir-fry the meat of your choice, ginger, green onions, celery, mushrooms, and bell pepper. Add the vegetable mixture to the eggs and matza. Heat one tablespoon of olive oil in a large frying pan. Pour in the matza-meat-egg-vegetable mixture. Cook over medium heat. When the bottom turns golden-brown, flip it over. This version of egg foo young is salty, chewy, and very satisfying. The sauce adds a touch of vaguely familiar exoticism. Charoset, a wine-infused, sweet, crunchy fruit-and-nut paste is one of the most delicious treats on the Seder table. How can we inventively use what is left? Transform it into a breakfast or dessert matza brie. 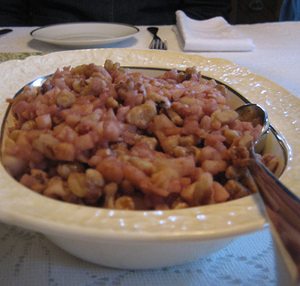 Place the charoset in a microwave-safe bowl. Cover and heat for two minutes. Pour the matza-egg mixture into the pan. When the bottom of the matza brei turns a golden-brown, flip it over. When the other side has cooked through, spread the charoset over it. This sweet and crunchy matza brie is a perfect pick-me-up any time. It goes especially well with some hot coffee or tea. Passover leftovers present us with the opportunity to be frugally innovative. As I reposition the foods that remain in my refrigerator, I remember a Yiddish expression that both of my grandmothers were fond of. They would exclaim, “Du vest dos uf essen!” “You will eat this up!” Chag Sameach!